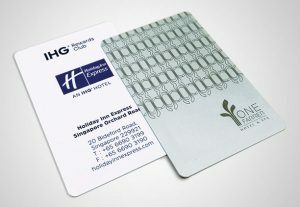 Currently, there are 2 main types of plastic key cards that are dominating the hotel key cards market, one is with magnetic stripes, and the other type is RFID card. As technology evolved, and with the increasing demand for higher security in hotel room access, hotels are gradually switching to door locks that operate on RFID key cards. At Idealcard, we supply both magnetic stripe (Hi-Co or Lo-Co) and RFID key cards. 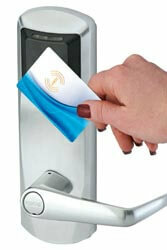 They are compatible with major hotel lock system, such as Vingcard, Saflok, Salto and etc. All can be custom printed according to your requirement. For magnetic stripe key card, it's pretty straight forward, there are only 2 types used in the market, namely High-Coercivity and Low-Coercivity (in short we called it Hi-Co and Lo-Co). They were the most popular key cards used before the RFID technology emerges. While magnetic stripe key cards have its advantage in terms of cost effectiveness, the durability and reliability of the magnetic tapes pose a concern to majority of the hotel operators. 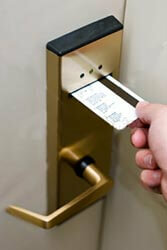 As a result, hotels are gradually migrating their door locks from magnetic stripe to RFID due to better security and reliability offered by the RFID cards. 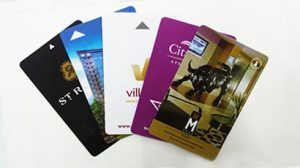 In the last 20 years or so, hotels turned to Radio Frequency Identification (RFID) keycards that come with a smart chip embedded in a plastic card and it works by simply tapping the card on the door lock to open the door. This technology eliminate the demagnetization problem of magstripe key cards and they were a lot more secured and convenient for both hotels and guests. MIFARE Classic 1K and Ultralight are among the most common smart chips used in the RFID Key cards for many major door locks, such as Vingcard, Salto, Saflok, Miwa and etc. However, one important point to note is that major lock suppliers such as Vingcard and Salto have these MIFARE card encrypted with their customised algorithm, hence a generic MIFARE card will not work on their lock system. Customer who wish to enquire about our hotel key card should also provide info in regards to the lock system their hotel deployed. We will provide the key card with the corresponding encryption to let you test out before placing your order. Whatever the case may be, our team of experts are here to guide you through in the process of sourcing the right key cards for your hotel rooms. Call us now!